Downing Street has called on Myanmar's leader, Aung San Suu Kyi, to take action against the violence aimed at Rohingya Muslims in the country. 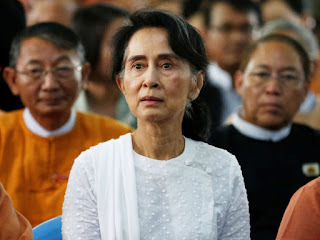 Offering their "full support", a Government spokeswoman said: "We hope that Aung San Suu Kyi can use her remarkable qualities to unite her country, stop the violence, and end the prejudice that afflicts Muslims and other communities there." She also said "it's vital that she receives the support of the Burmese military", which Britain has given £8m in order "to address the humanitarian crisis there". Unrest in Myanmar, also known as Burma, has left hundreds dead with nearly 90,000 Rohingya civilians leaving the country and fleeing to neighbouring Bangladesh. Nobel Peace Prize winner Malala Yousafzai has also called for Ms Suu Kyi - a fellow laureate - to condemn the "tragic and shameful" treatment the Rohingya, saying the "world is waiting". The youngest ever recipient of the prize said she was "heartbroken" by reports of young children being killed, and she urged the Burmese government to grant the stateless group citizenship. So far, there has been no let-up in the violence, with thousands fleeing every day. Almost 400 people have died in the unrest. On Monday, two explosions tore through an area near the Bangladesh border, amid reports of fire, thick black smoke and gunshots, with one woman said to have lost a leg.